I picked up some new tools at NCECA last month. One of the tools that I bought from Bracker’s is the Bevel-o-Matic from Todd Sholtz of Claystamps.com. I had wanted to talk with Todd about his new tool, but I kept missing him. So I brought it home from Pittsburgh and started using it… without any directions. It took me a couple of minutes to figure out how to use it, and I instantly loved it. After I got home that night, I checked in online to see what sort of info was up about this new tool. That’s where I discovered that I was using it incorrectly. Oops! But I liked how it worked and I’ll have to play around with it some more to see if I want to change my ways. 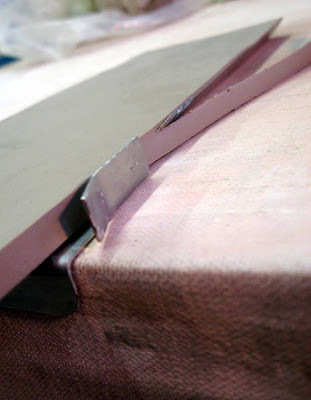 The Bevel-o-Matic is a simple tool for beveling the edge of a leather hard slab with a razor sharp cutter at a 45 degree angle so you can create a clean, sharp mitered joint. 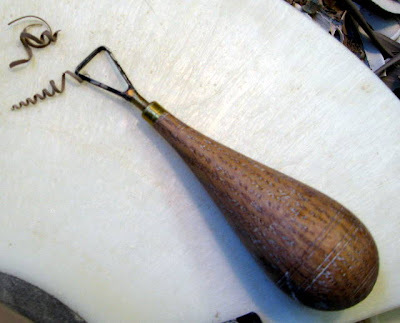 I’ve used several other bevelers that are designed with an angled wire to cut the edge but I didn’t love them. For the way that I use a beveling tool, I prefer the Claystamp.com beveler’s sharp razor edge better than the wire ones. Above you can see how I used the tool. (correct/suggested usage is the last photo). 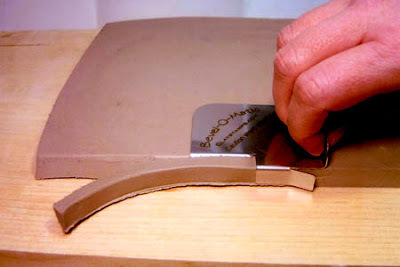 I hooked the metal Bevel-o-Matic over the edge of the table and pushed the leather hard slab over the tool. The clay is easily cut away leaving a very clean beveled edge. Caution: By using it this way, you do have the possibility of cutting yourself. I did like how hooking the bevel tool over the edge of the table allowed me to have lots of resistance and made it easy to cut a slab that was pretty firm. The parts went together perfectly thanks to good measuring and nicely beveled edges. Here is the proper way to use the Bevel-o-Matic. You’re supposed to drag it across the top of the clay instead of hooking it onto the table and running the clay over it. Thanks to Bracker’s for this photo. Of course there are other options for beveling, and you don’t need a special tool…but I appreciate a tool that makes a job a little easier. If you’re a big hand builder, and you’ve been using this tool regularly, I’d love to hear from you. Another note on Claystamps.com… I wrote about this company 3 years ago on this blog after I got a signature stamp made: A Potter’s Mark: Signing Pots. In the taxi on the way to the Pittsburgh airport on Saturday morning our driver asked if we were in town with all the ceramics people. We said yes and he asked “what do you make: pottery or knick-knacks?” Isn’t that a great question? NCECA is usually held in a smaller city: Pittsburgh, Louisville, Portland, Baltimore, Indianapolis, etc… I often wonder what the host cities think about “us.” I don’t know how many people attended this year, but I know that in the past attendance has hit about 6000. In the immediate area of the conference it can feel like every square foot of space is filled with potters and sculptors (and knick-knack makers!). I wanted to share a couple more images from my trip (again, this is just a tiny snippet of the week!). This is the exhibition hall where vendors, schools, publishers, etc… have booths set up. It felt a little smaller this year than in the past (the whole conference felt that way). But that in no way means that there wasn’t enough to see, hear & buy! I got some fun new tools that I’ll share with you in the near future. Most of the images that I am sharing with you were from the La Mesa tableware show from Santa Fe Clay. It’s always one of my favorite shows, and one that I usually go to see 3 or 4 times. There were 150 place settings from different ceramic artists this year. Amazing! Molly Hatch I’ve been eying Molly’s work for a while. I love how she outline the shapes with a sketchy line. Michael Kline I’m a big fan: I eat my steel cut oats out of one of Michael’s bowls every morning and I’m a faithful reader of his blog. I love these pieces with the white slip and wax resist lines.